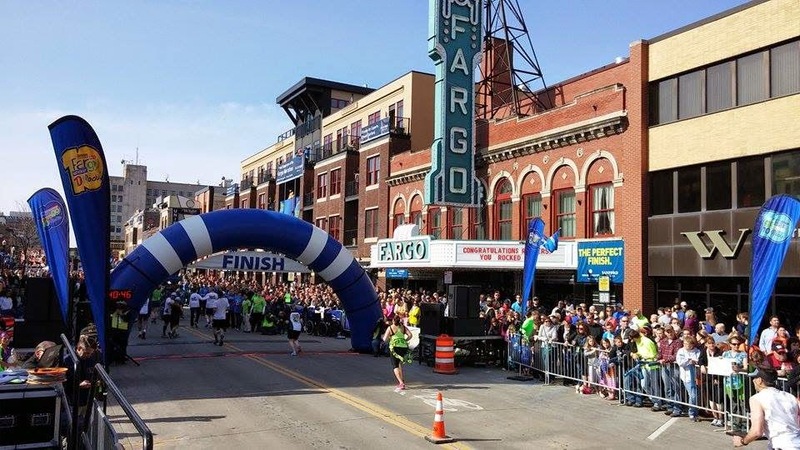 This weekend reminded me why the Fargo Marathon is my favorite race ever. The course is great (and flat), but the race environment and spectators are what make this race so special. The race course was lined with spectators from start to finish. Music, cheering fans, and runners everywhere! And we only had to travel 2 hours to get there. It doesn't get much better than that! Quick Sidenote: Looking for an easy way to keep track of your race results? Athlinks.com is a great site that keeps a record of your race times and placings! Placing - Overall: 166th out of 5173. Females: 35th out of 3303. We couldn't have asked for better weather on race day! The sun was shining and the temp was in the mid-60's - perfect running weather. My very kind sis-in-law, Danielle, brought Mark (her husband/my brother) and me to the Athlete's Village at 6:45. The morning was a bit chilly so we hung on to our warm-up clothes as long as possible.The porta-potty lines were ridiculously long so we decided to take our chances and just not "go" until after the race. Now that's risky business! Sleep was scarce the night before the race. E had a bad night of sleep so he ended up in bed snuggling with me most of the night. We had a little snoring issue in the hotel room, too, though I'm not blaming my parents because I happen to be a world-class snorer myself! But those who hope in the Lord will renew their strength. We weren't in the Athlete's Village for very long before it was time to drop off our bags and head to the starting line. My brother and I made our way up to the 1:30-1:45 pace group for the starting announcements. While waiting, I ate half of my "Espresso Love" GU Gel because I was already hungry and we hadn't even started running yet! 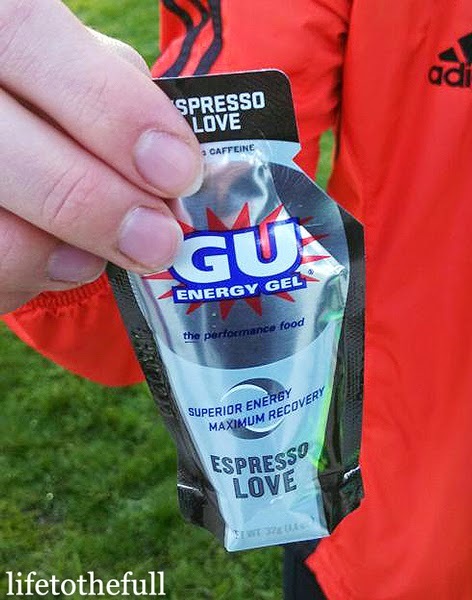 I adore coffee, so I thought "Espresso Love" sounded like the best GU flavor ever... but it didn't sit in my stomach so well. The flavor was really good but I was so thirsty afterwards. Mark took off in the front of the 1:30 group and I was a few minutes behind him. For the first two miles, I was at a sub-7:00/mile pace which was almost a minute faster than I had planned! I was caught up in the momentum of the herd but the pace felt easy (at the time). Half/Full Difference #1: Those half marathon people start out fast and they stay fast! In the full marathon, my strategy is to hold back for the first 6-miles in order to survive the next 20. The race is long and I have a chance to make up ground later in the race. In this half, the 1:30-1:45 group started out fast and most stayed fast! I kept thinking to myself "Slow down or you're going to regret it later!". I trained for a ~1:40 finish time and wasn't sure if I could hold this for the full race. By mile 9, I was pretty well shot and my stomach was feeling horrible. I grabbed a Vanilla GU Gel from the aid station and tried eating half of that. The sugar seemed to give me a little boost but I was still nauseous. 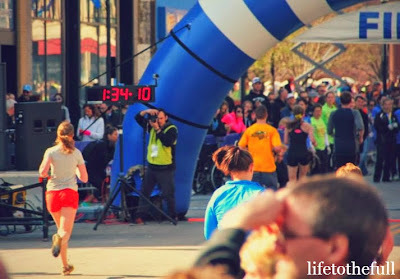 Thank God that He doesn't mind hearing our sometimes off-the-wall prayers because mine at that time was "God, please keep me from throwing up in this race". Praise God, He did just that! My watch died at mile 10 and I didn't know if I could keep a sub-8:00 min. pace to the finish. 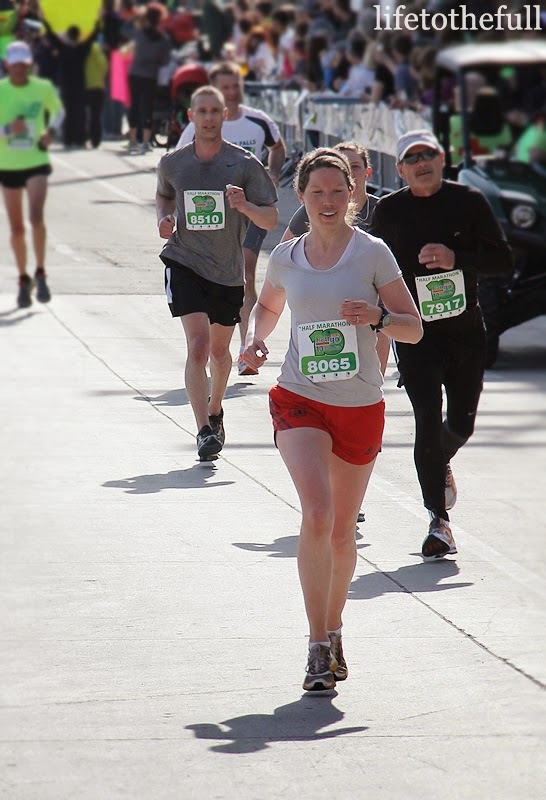 While pushing through the last 5k, I kept thinking (Isaiah 40:31 in exhausted fragment sentences) "Hope in the Lord. Renewed strength. Run and not grow weary." Half/Full Difference #2: Less time to chat. In past marathons, I have met a nice person or two to visit with as the miles passed, but during this half there wasn't much visiting going on for me. I think it was due to the pace difference and a shorter race distance. I am much more chatty at a 8:15/mile pace rather than 7:12/mile! E hung out with my family and my friend Megan while we were running. 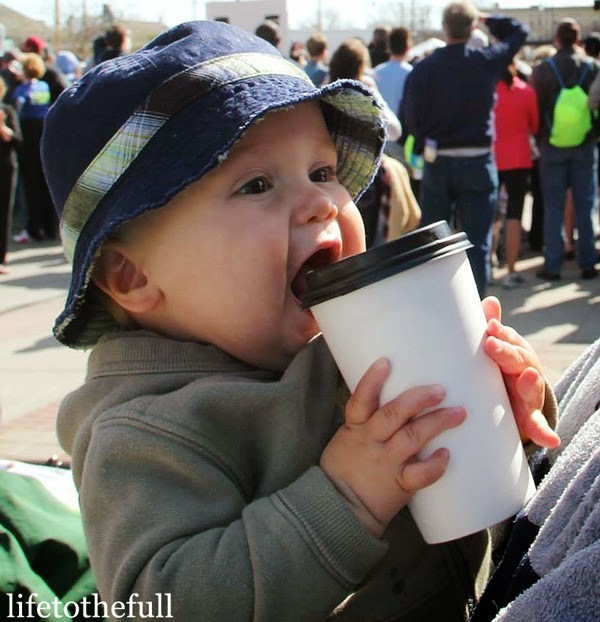 Since he's 14 months old now, he's basically a grown up and likes to "pretend drink" coffee! At the end of the 13.1, we were so glad to cross the finish! Mark crossed the finish line at 1:30:58 and I did a few minutes after in 1:34:08. Half/Full Difference #3: Half training was more baby-friendly. 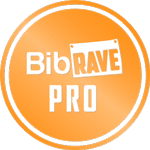 According to most long-distance runners, I ran extremely low mileage in training for this race with 35 miles being my peak mileage week (yes, that is ridiculous)! My mileage looks pretty good compared to Mark's, though. The farthest he ran was a 7-miler, yet he is so bull-headed that he still finished in a great time! The lower mileage and lack of 20-milers made training much easier to fit in. 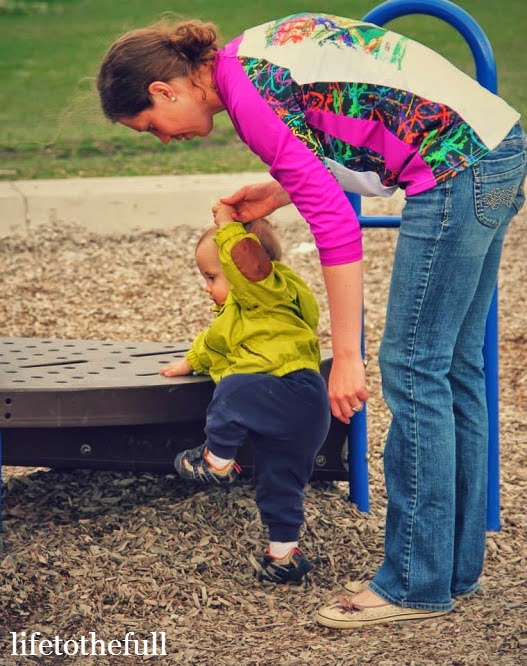 Most training runs could be done early in the morning, during nap-time, or out with E in the jogging stroller. Conclusion: Half marathons are a blast! 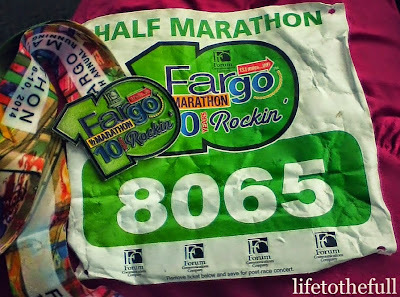 My first half felt like a really long sprint. Post-race recovery has been great. E wanted to play on the playground after the race and my right hip was stiff climbing up and down the stairs, but after a night's sleep it was back to normal. The 26.2 will always be my favorite race, but 13.1 is the perfect distance for me while we have little people running around the house. Thank God for the gift of running and the health to be able to run. Thank you to my amazing husband for driving to Fargo after work and spending Mother's Day with me! Thank you to my awesomely supportive parents who help me so much. Whether it was horse shows back in the day, tennis matches in college, or races now, they have always been there! 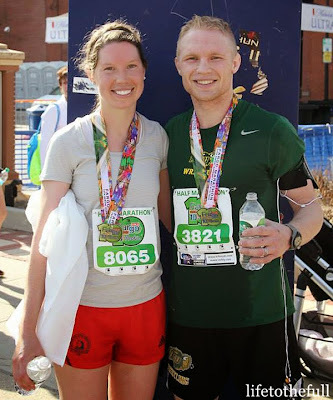 Thank you to my brother for beating me (as usual) by ~3 minutes and for his wifey coming to watch us. Thank you to my best friend Megan for cruising the race expo with me looking for free stuff. And thank you to Mr. E for making me a "mom" and for behaving for Grandma and Grandpa while I ran! What's better than a post-race playground trip?! LET THE GLORY BE GOD'S. 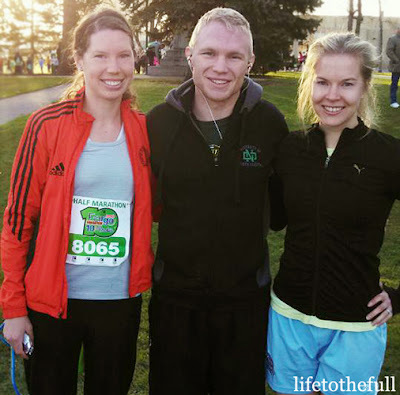 Linking up on Whimsical Wednesdays and Fitness Friday. What an awesome race! You did great. :) I love all of the pictures and am so glad you were able to still train for a race while still giving E the attention he deserves. 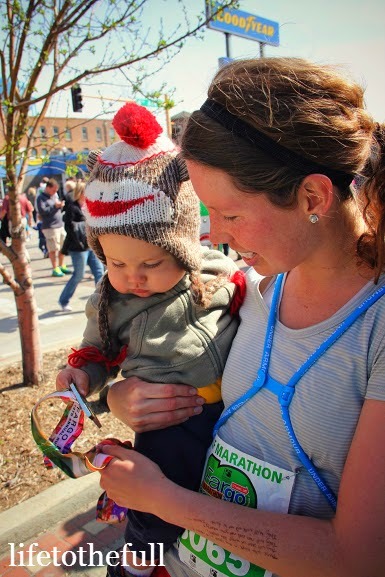 Do you have any half marathon tips for this first-timer? My first half marathon race is in two weeks from tomorrow! Also, after you cross the finish line, take a little time to walk around and stretch after! It's tempting to just collapse on the ground, but it will help your body in the long run to loosen up again and stretch.